This case is designed to hold either all CDs, or a combination of both CDs and DVDs. A design feature is that the center shelf is adjustable to three different positions. 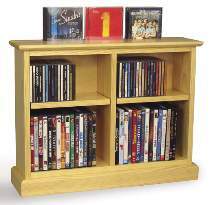 With the center shelf in the highest position as pictured, the upper and lower cavity will be properly proportioned for CDs on top and DVDs on the bottom. With the shelf in the center position, both shelves can be loaded with CDs. This project can be placed on a tabletop or wall shelf, or it can be placed on the floor as a stand-alone cabinet. Make the main body of the cabinet from “1x8” pine boards. The back can be either .25” hardboard or .25” plywood. Project measures 19”H x 25.75”W x 6.75”D. Order shelf supports separately below.